Our Custom Leather Tara Crossbody Bag measures approximately 6-1/8" x 3-1/2", with tapering gussets of 1-1/2" to 1" in width. 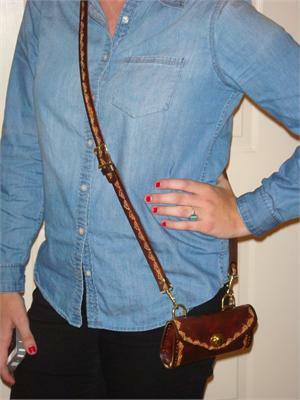 This purse features a secure clasp and an adjustable strap with a drop of 22" to 26". All of our Tara Crossbody Bags are hand tooled and NEVER embossed.